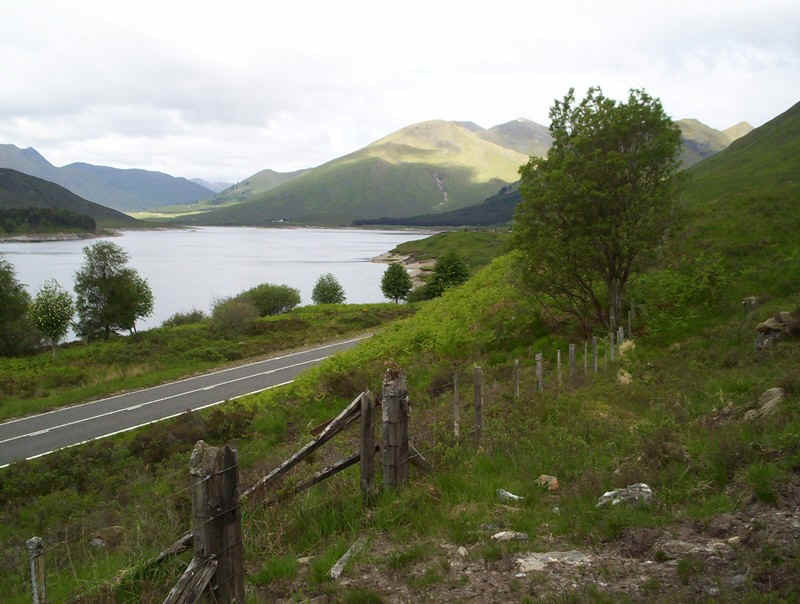 I started the day with a brisk walk along the A87 enjoying the views, although clearly the perfect weather of the previous few days was passing. 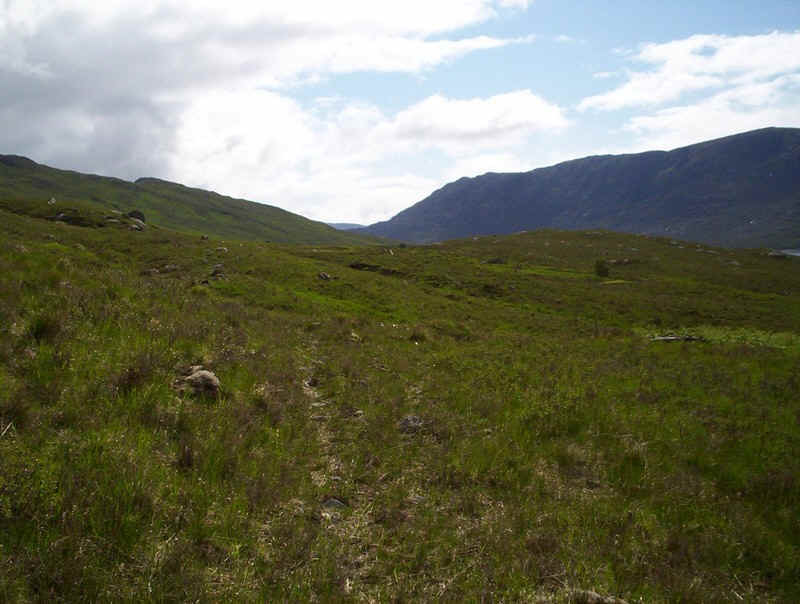 The maps show the course of the old military road starting near the bridge over the Allt Choire a Chair so I looked out for signs of it. 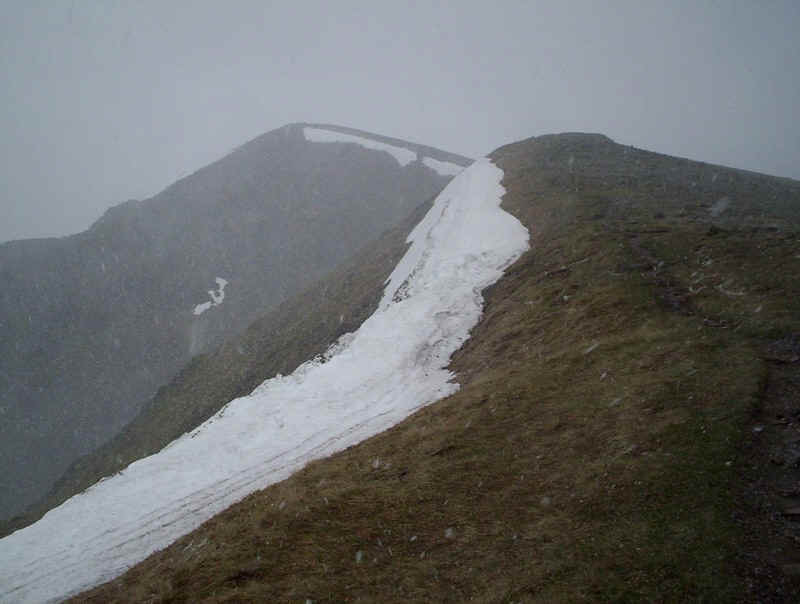 A scramble up the hillside and through this gate found a faint track which I followed east. 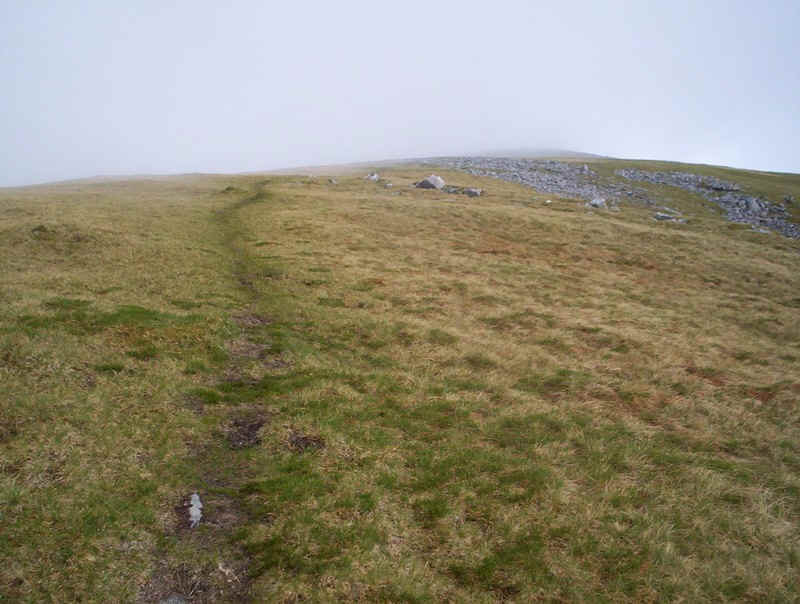 At times the path is very faint and in wet weather it might be very boggy. 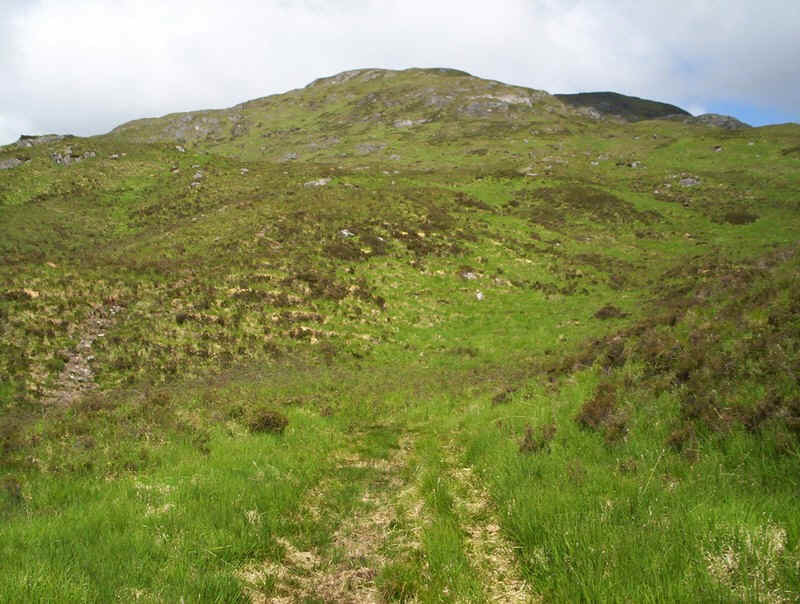 Eventually the old military road comes to what is euphemistically marked on the map as "ford". Now maybe two hundred years ago it might have been safe to cross but I really didn't like the look of those sloping slabs with the river flowing over it. 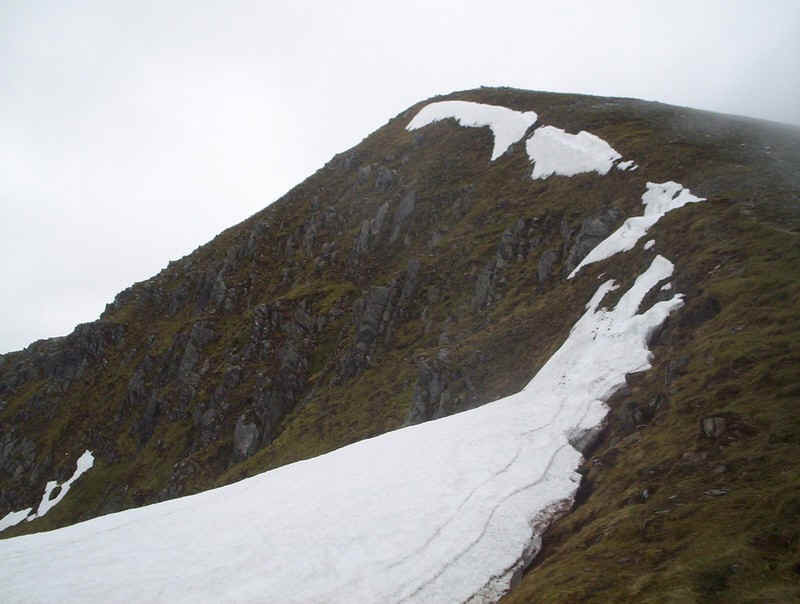 My plan had been to continue along the old road and climb Carn Ghluasaid first but clearly I wasn't going to be able to cross here. 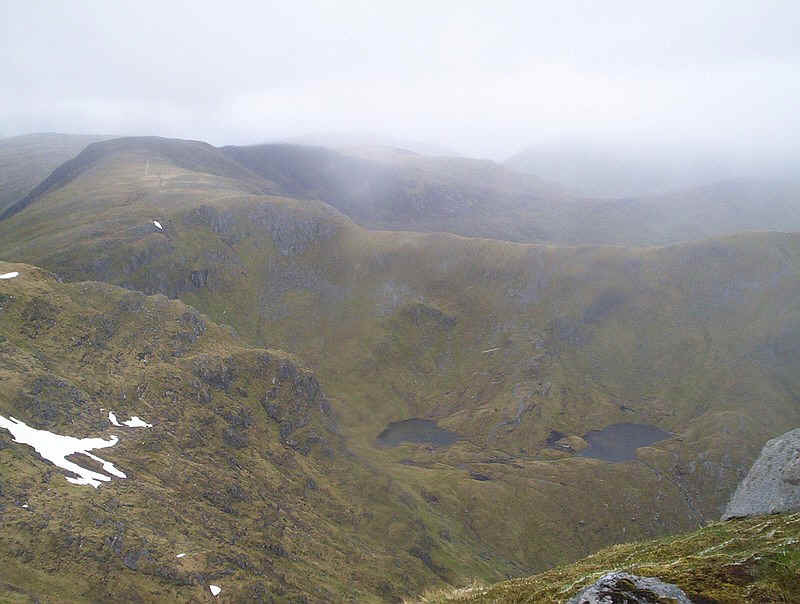 A glance at the map revealed that if I walked upstream I'd come to the ridge that led to my intended return route over Meall Breac. I decided, therefore, to reverse my intended route. 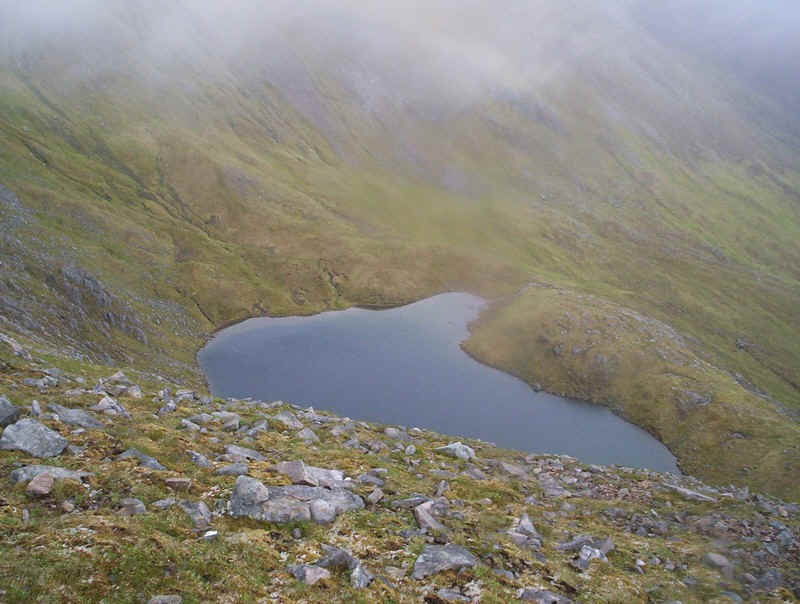 I'd climb Meal Breac, go over Droichaid an Tuill Easaich, take the avoiding path around Sgurr nan Conbhairean and on to Sail Chaorainn before returning over Sgurr nan Conbhairean to Carn Ghluasaid. 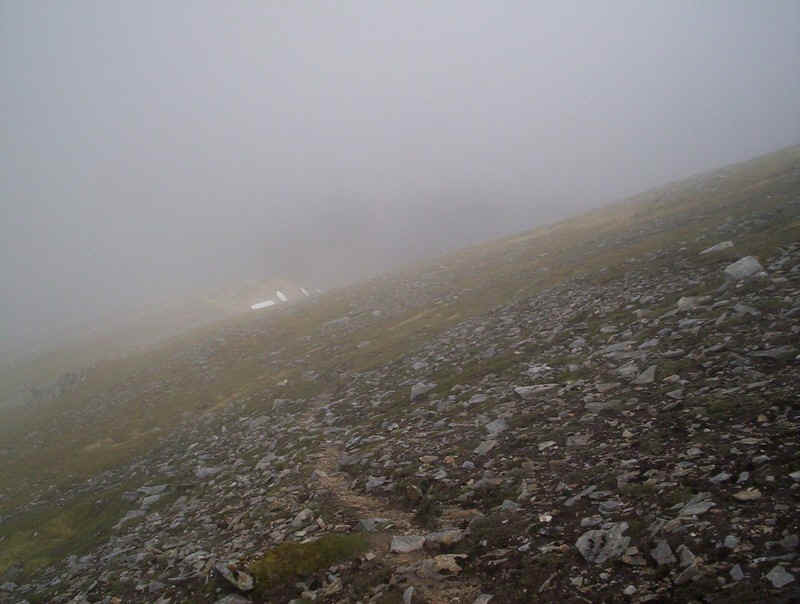 In fact there is a faint track by the stream so clearly I'm not the first to follow this route. 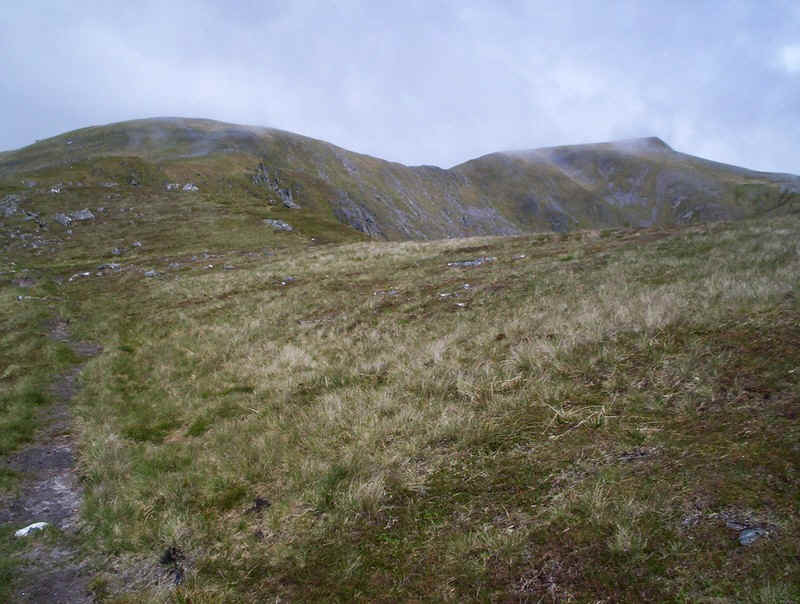 Once on the ridge to Meall Breac there's a clear path almost all the way to the other summits. 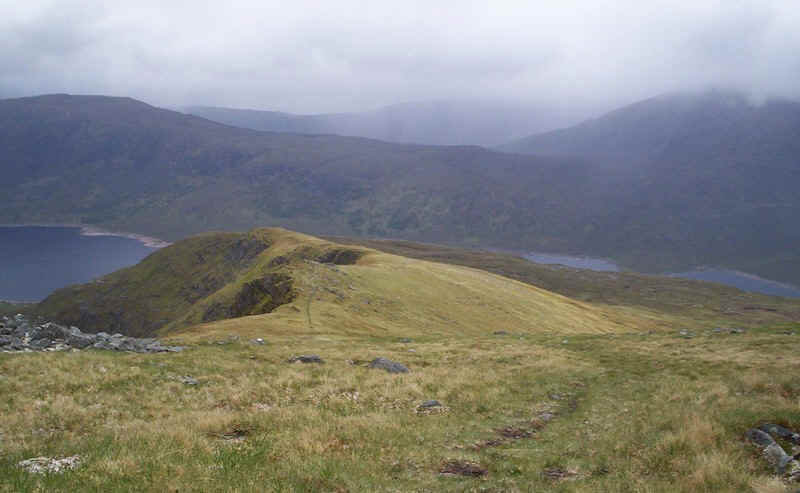 Looking back down Meall Breac's ridge to Loch Cluanie. 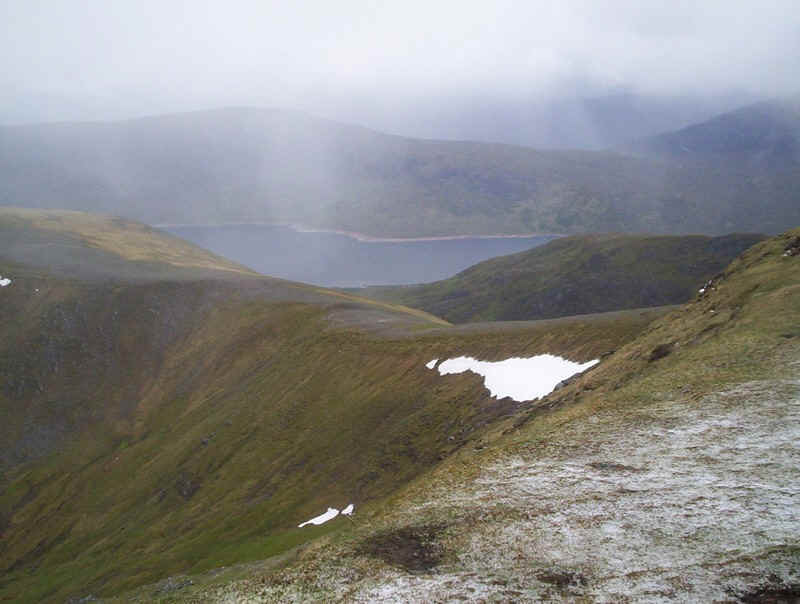 By now the weather was changing with frequent snow showers and cloud drifting in and out. 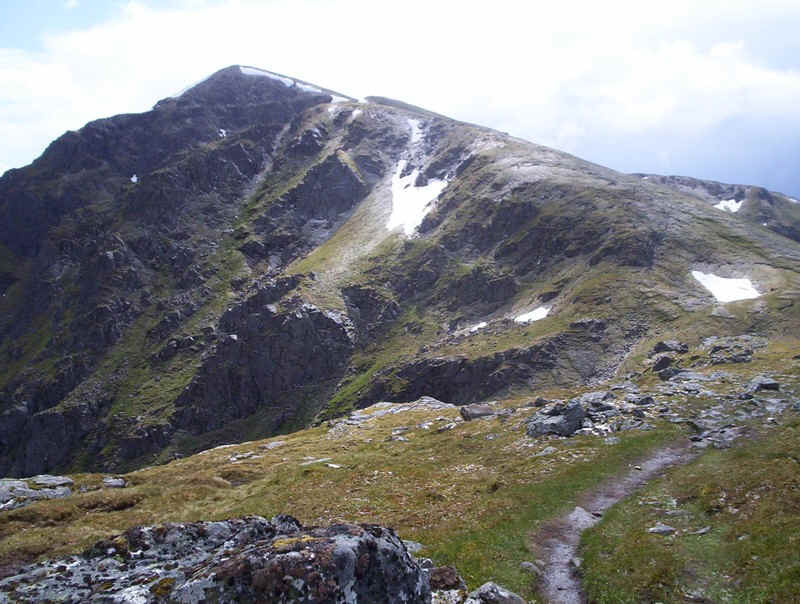 The photo shows the path ascending the ridge to Droichaid an Tuill Easaich, on the left, with Sgurr nan Conbhairean on the right. 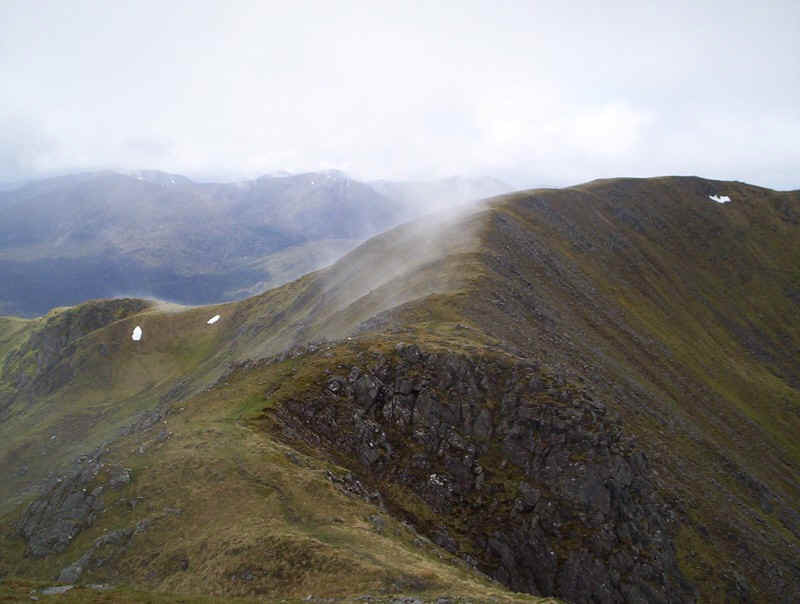 In one of the sunny spells there was this dramatic view of the South Glen Shiel Ridge. 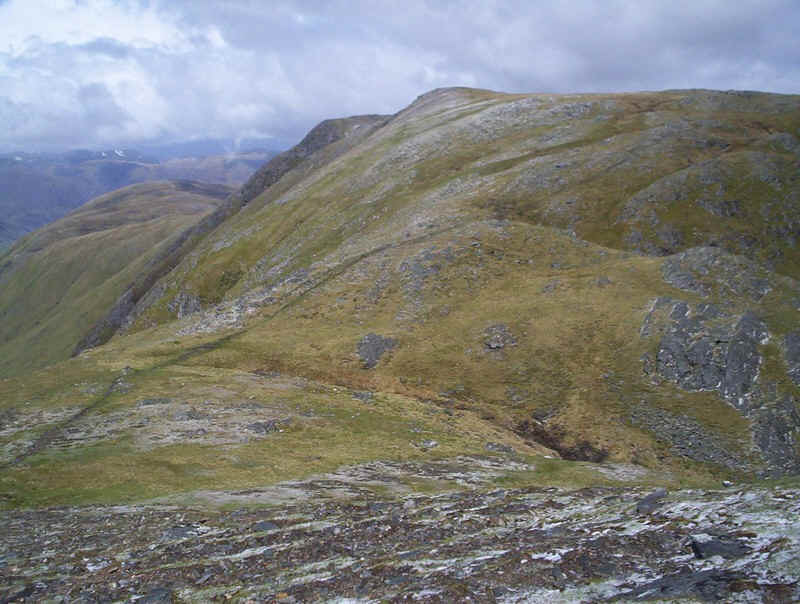 Looking back down the ridge towards Meall Breac - lovely easy walking. 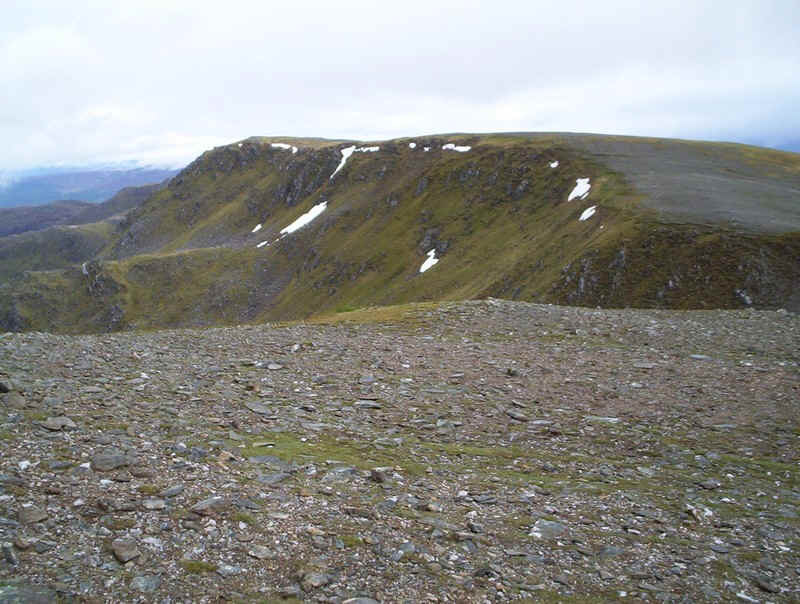 The path doesn't actually go over the summit of Droichaid an Tuill Easaich but skirts the hillside with this dramatic view of Gorm Lochain far below in the corrie; it's a long way down and I was careful where I put my feet! 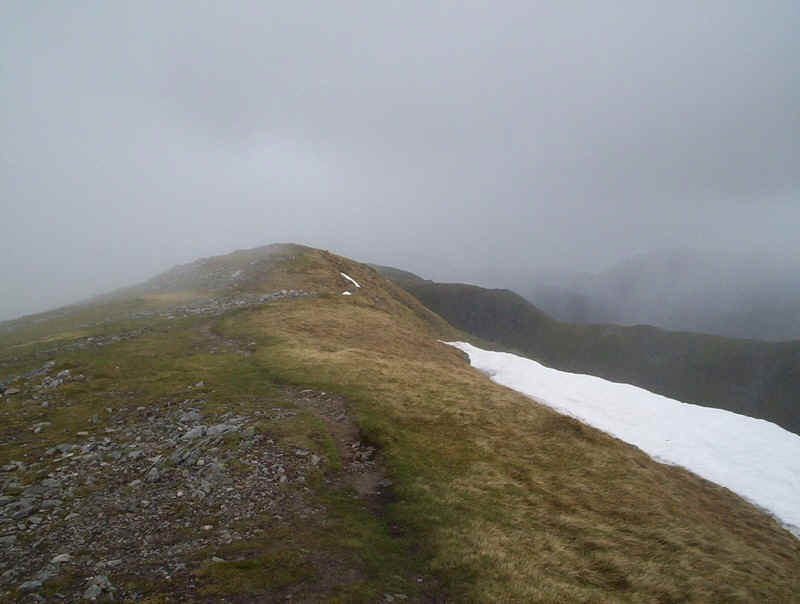 By now the weather had seriously deteriorated as I walked along the ridge between Sgurr nan Conbhairean and Sail Chaorainn. 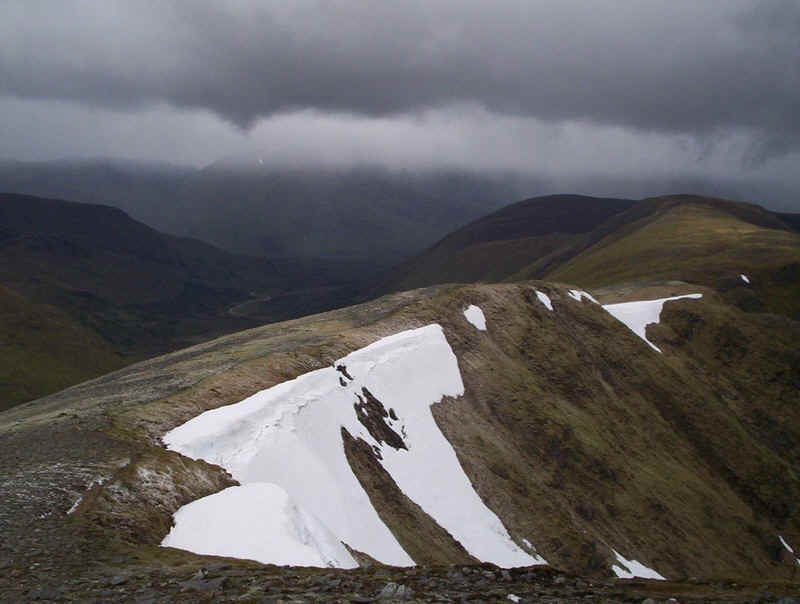 As I took this photo looking back to Sgurr nan Conbhairean a violent, and very painful, hailstorm started and I had to stop and crouch down with my back to the sudden gusts of wind until the squall passed. 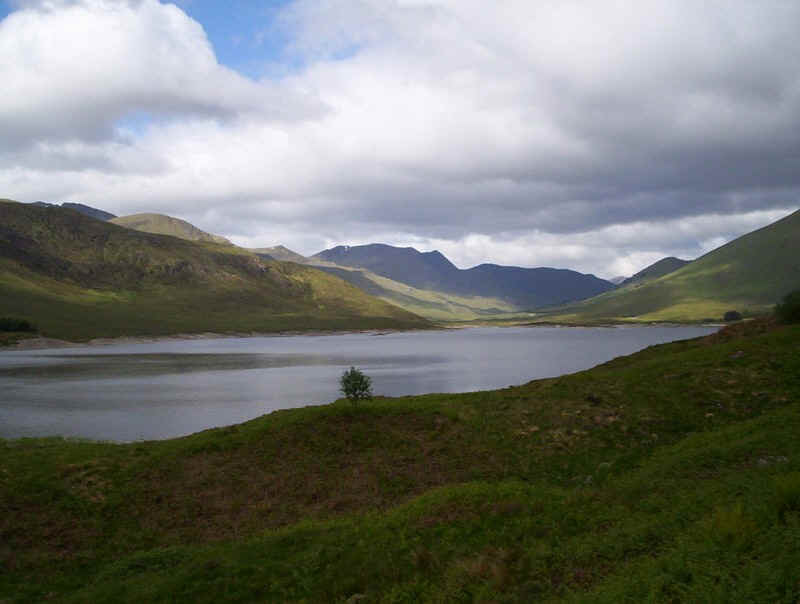 And then the sun came out, and I had a view of Sail Chaorainn in the distance. 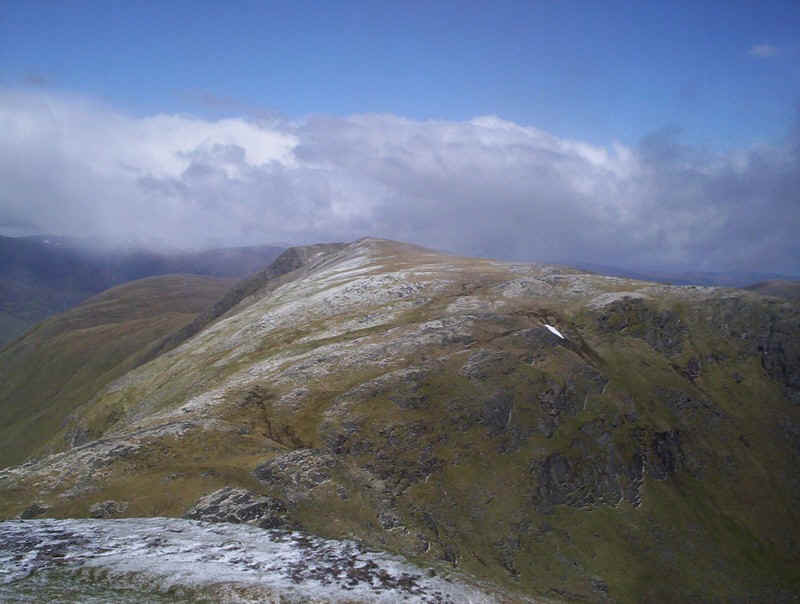 Looking across Gleann na Ciche to A'Chralaig with evidence of the recent weather conditions. 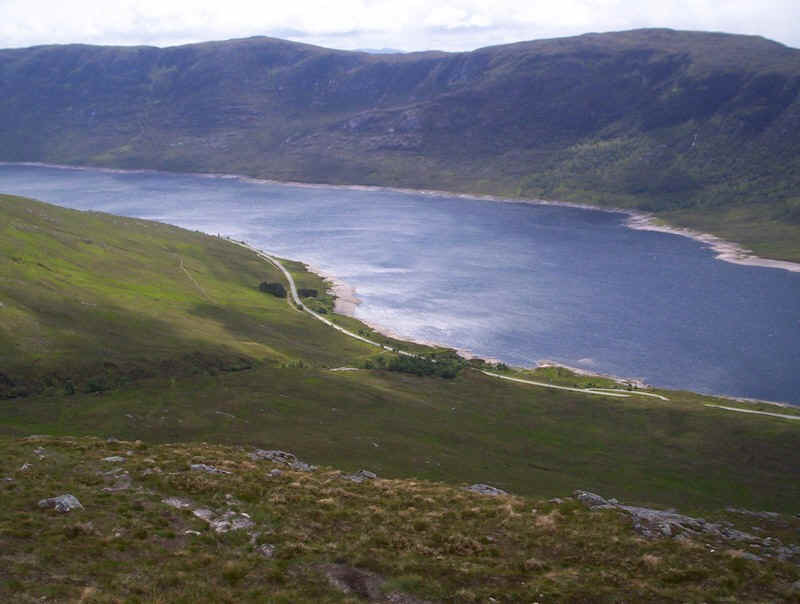 The path falls to a dip at 914m before the climb to Sail Chaorainn. 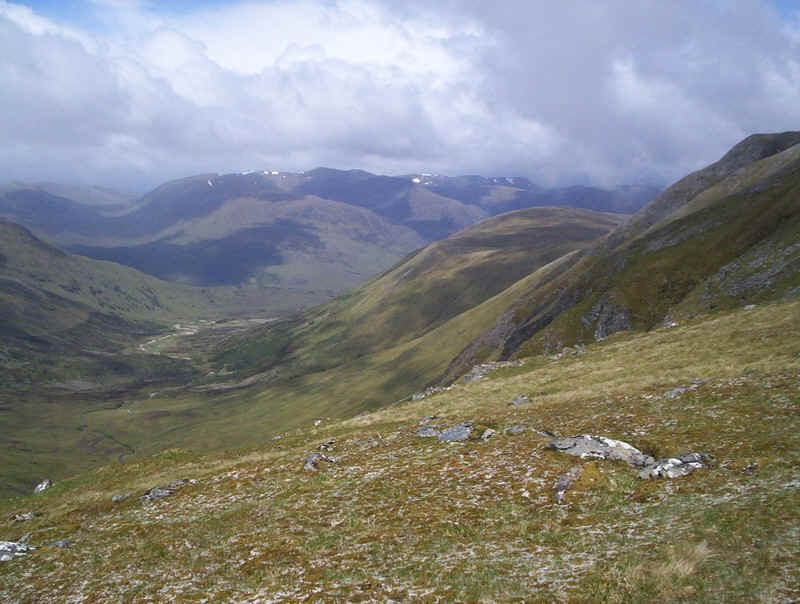 Looking down Gleann nan Ciche to Glen Affric. 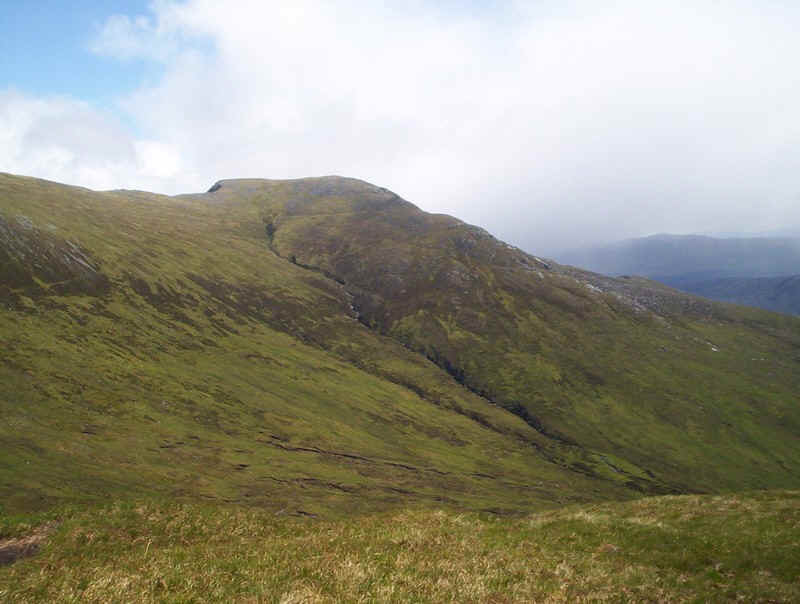 The final section is an easy stroll across grass to the summit of Sail Chaorainn reached four hours after leaving the inn at Cluanie. 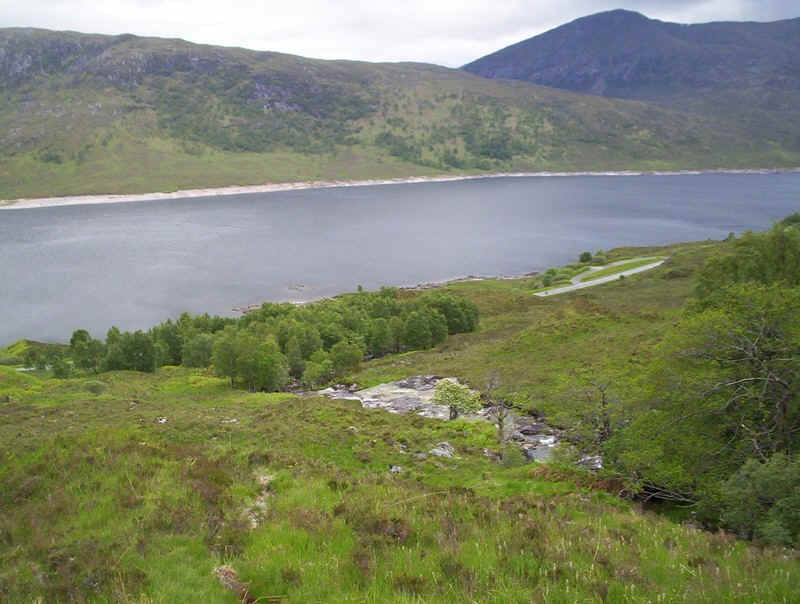 I'd actually wasted a lot of time by using the old military road and decided not to use it again on the return. 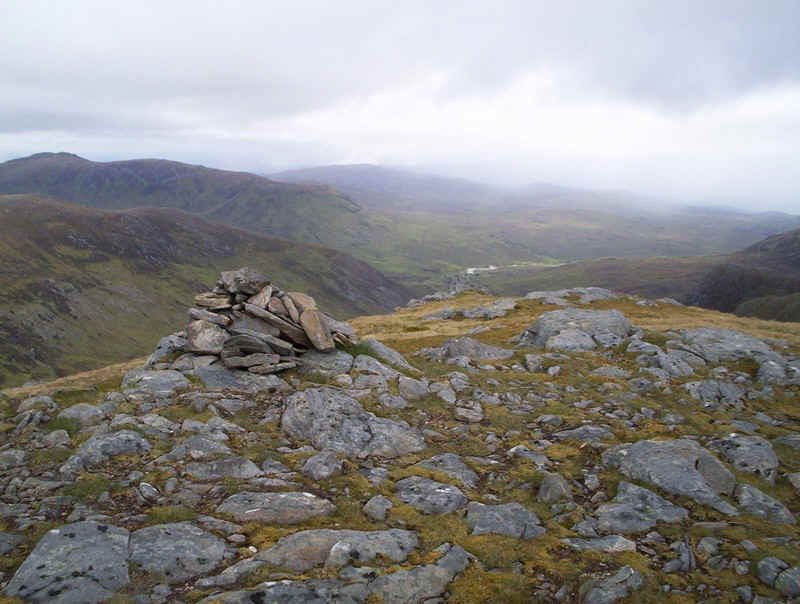 The cairn of Sail Chaorainn (1001m) with the hills beyond Glen Affric in the background. 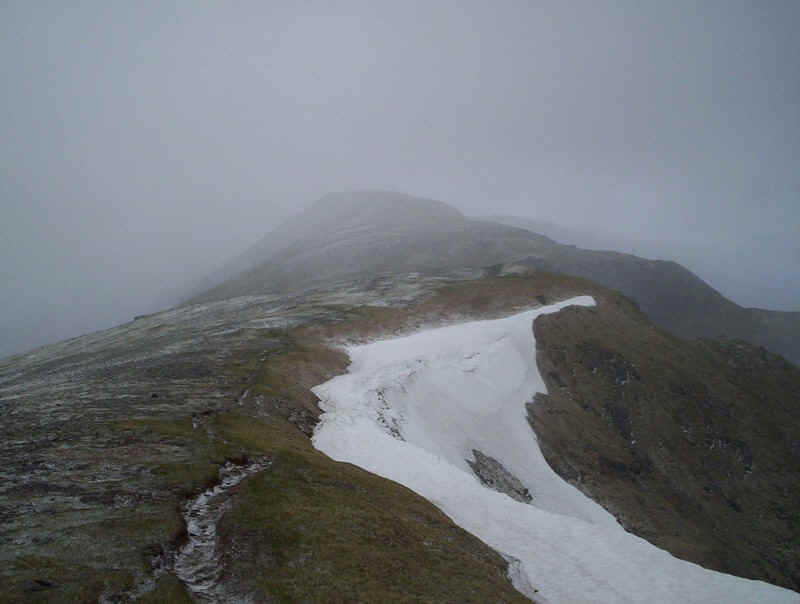 .....but winter returned as I climbed uphill towards the summit. 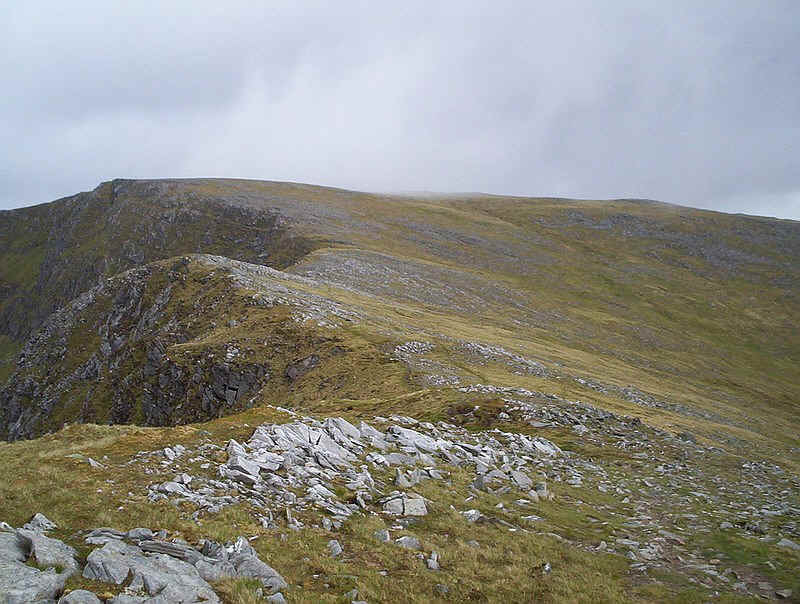 Looking back along the ridge to Sail Chaorainn. 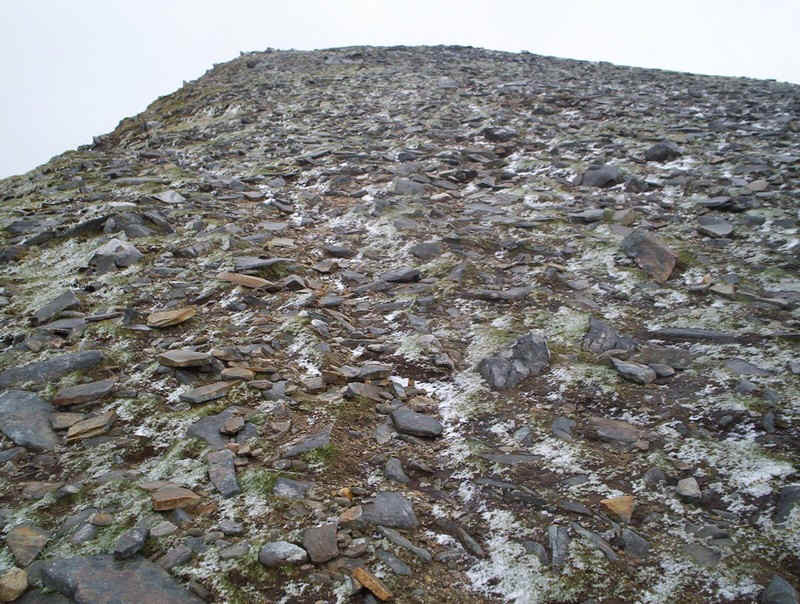 The final climb to Sgurr nan Conbhairean is over stony ground with no obvious path but as long as you stay away from the cliffs there are no problems. 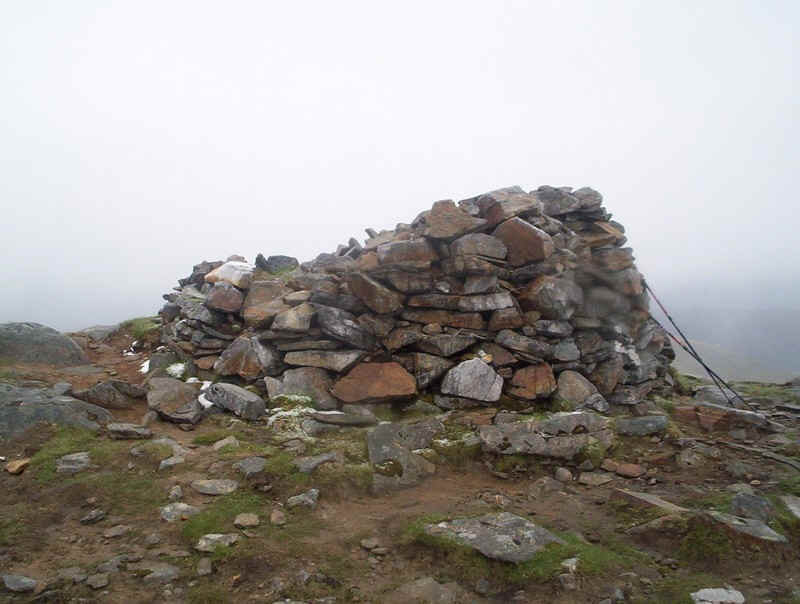 The summit cairn of Sgurr nan Conbhairean (1109m) and the only cairn in my four day's walking that had a proper wind shelter in it. 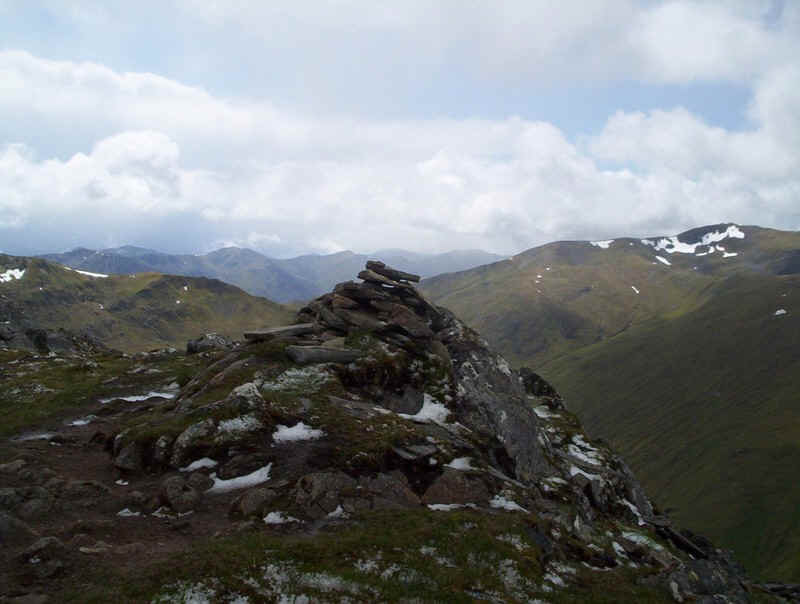 It had me less than an hour from Sail Chaorain to reach this summit and I sat out another squall protected by the shelter. 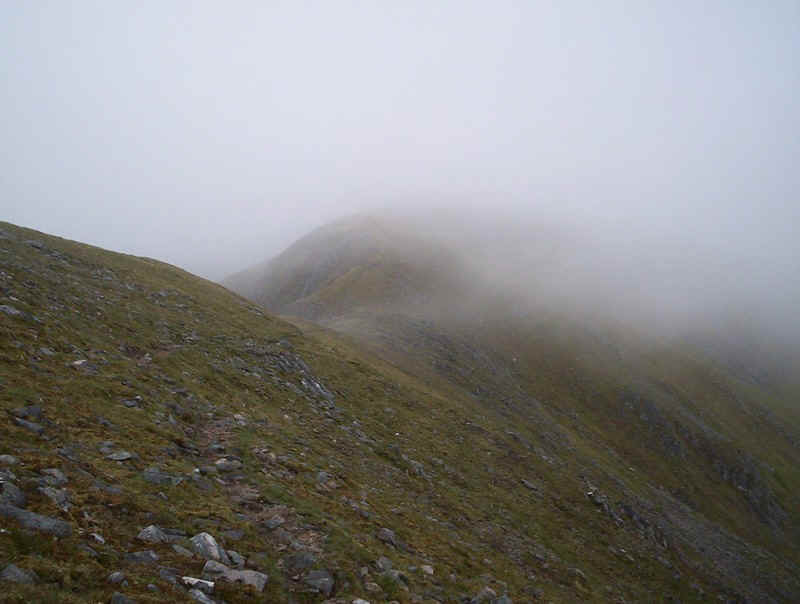 I suspect getting down from Sgurr nan Conbhairean could be confusing in mist as there are ridges in three directions all of which are over similar stony terrain. 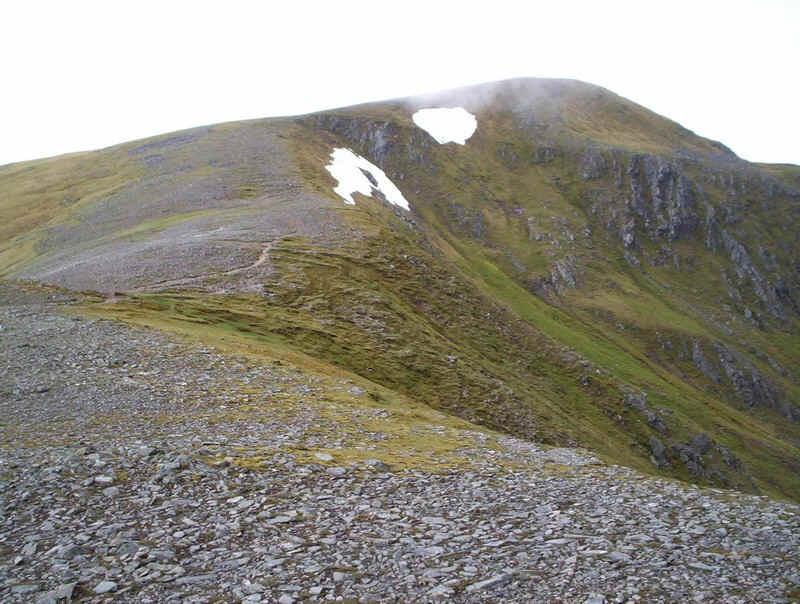 Here I'm going down the south west ridge to Glas Bhealach. 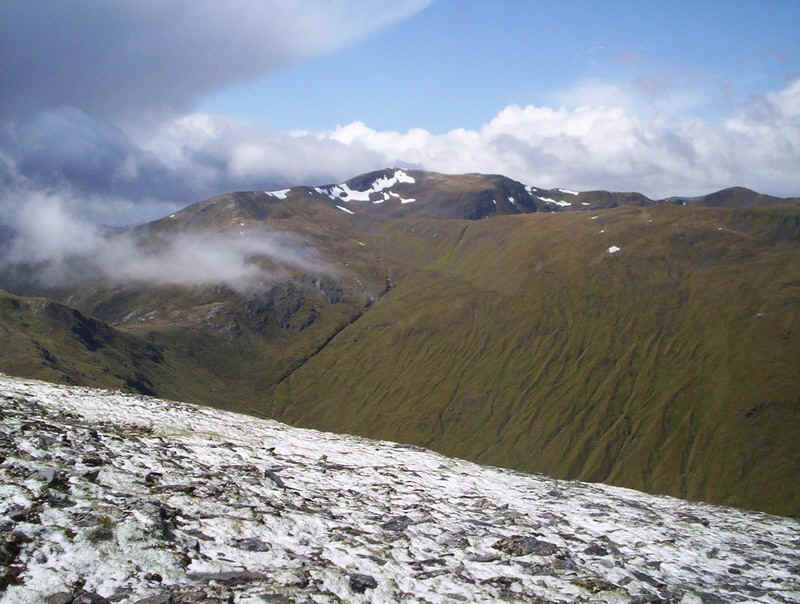 After the bealach there's a slight rise to Creag a'Chaorainn with it's summit over to the left of the long gently sloping ridge. 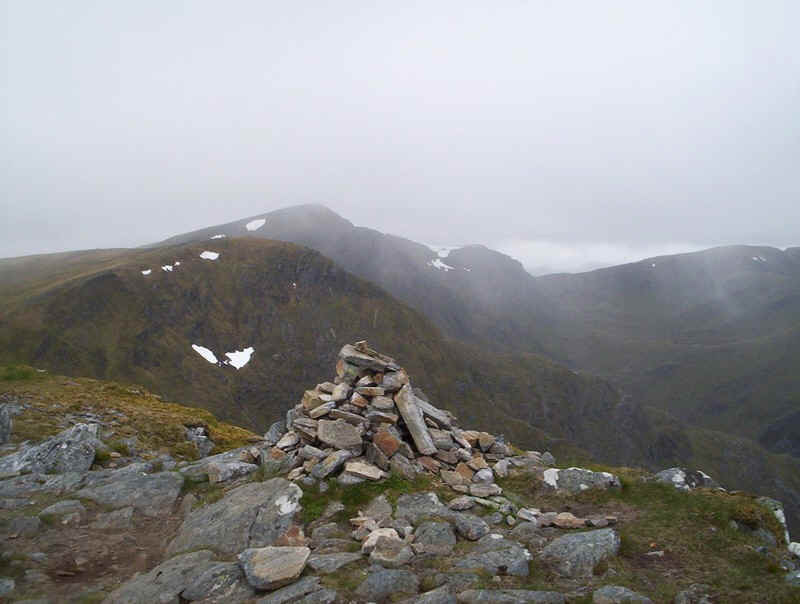 The last Munro of the day, Carn Ghluasaid, and its cairn ((957m) with Sgurr nan Conbhairean behind in the mist. 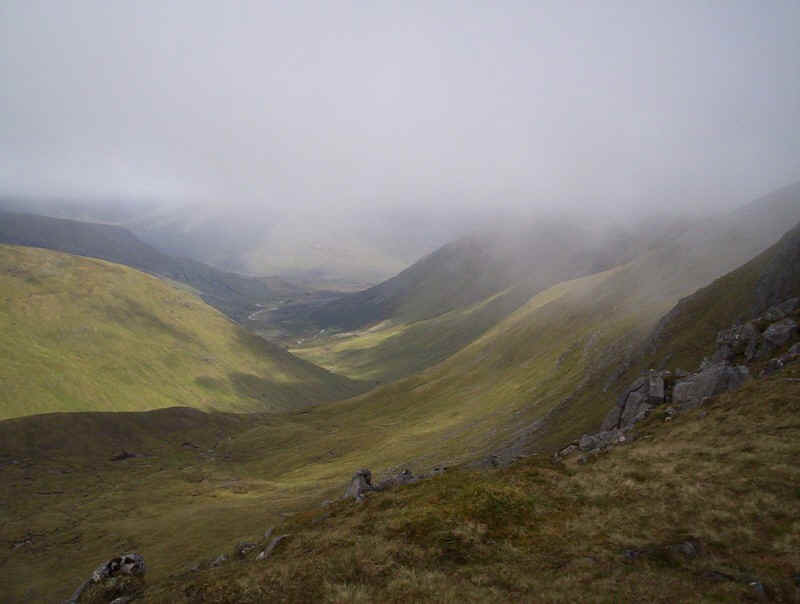 Initially, I had thought of returning down the stalkers path to Lundie but I realised that if I headed across towards the Allt Coire nan Clach I would reach the path that is shown running down by the side of the burn. 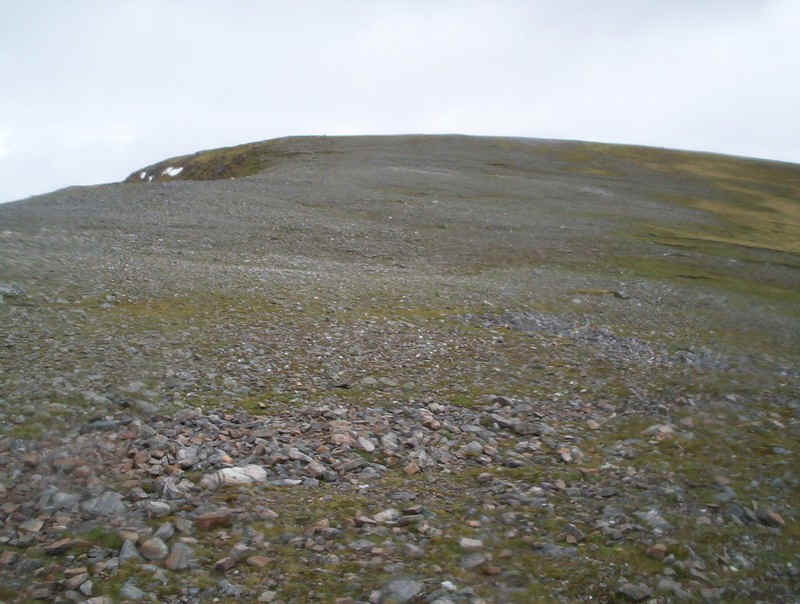 I'd then end up near the supposed "ford" where I could get straight down onto the main road. 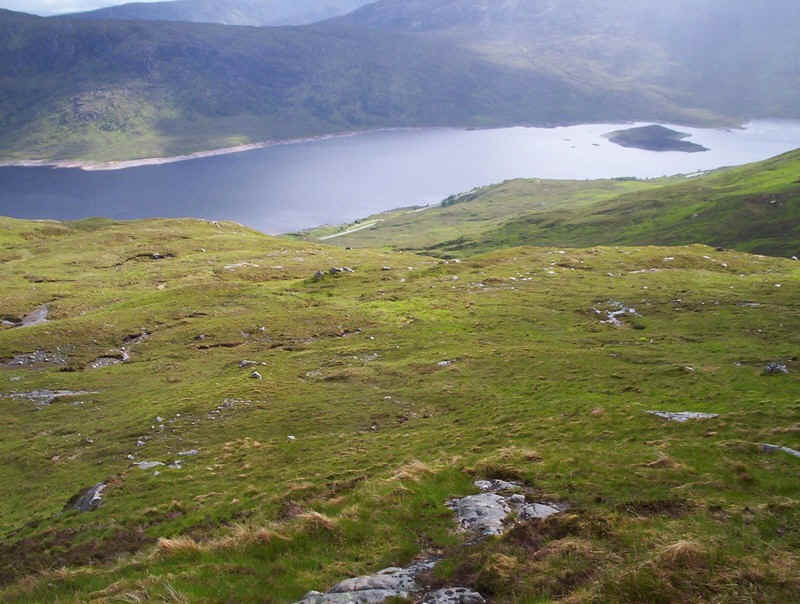 I simply left the path and headed down hill across grass, and the occasional steep section heading all the time towards Loch Cluanie. 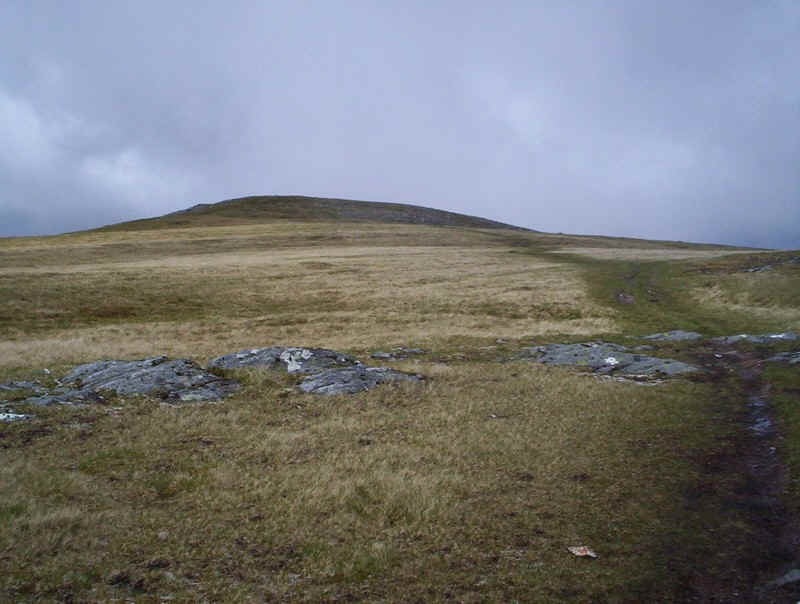 Eventually, I joined the path at about Grid Ref 128 114. 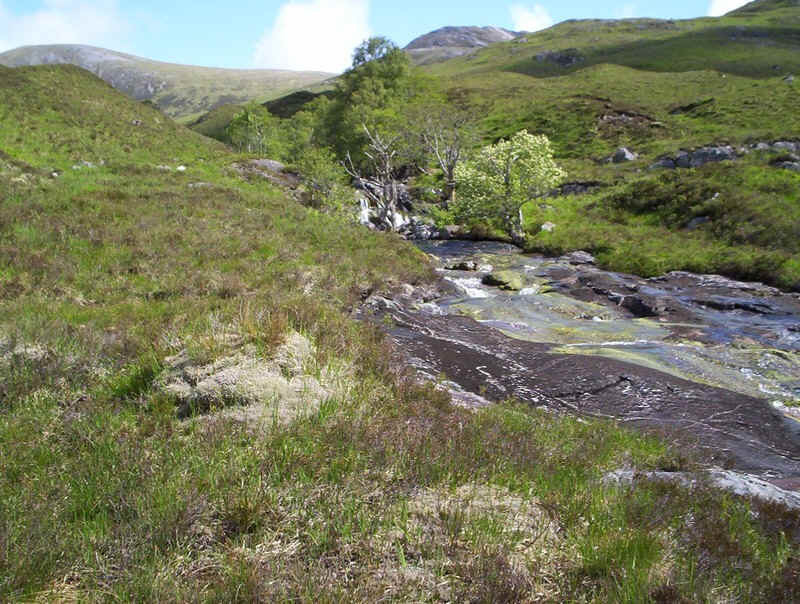 The small wood at the end of the Allt Coire nan Clach and the "ford" mark the end of the hill walk. 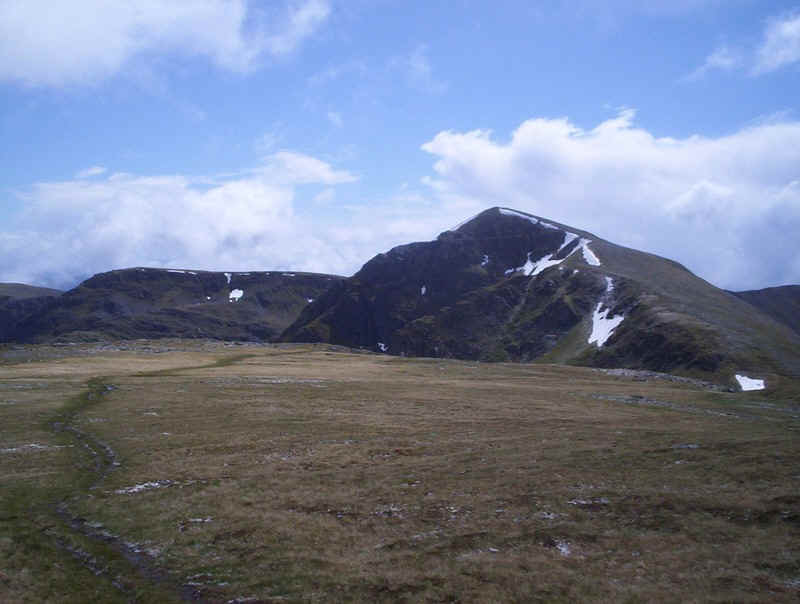 I was back on the road seven hours after starting the hill walk at this point. 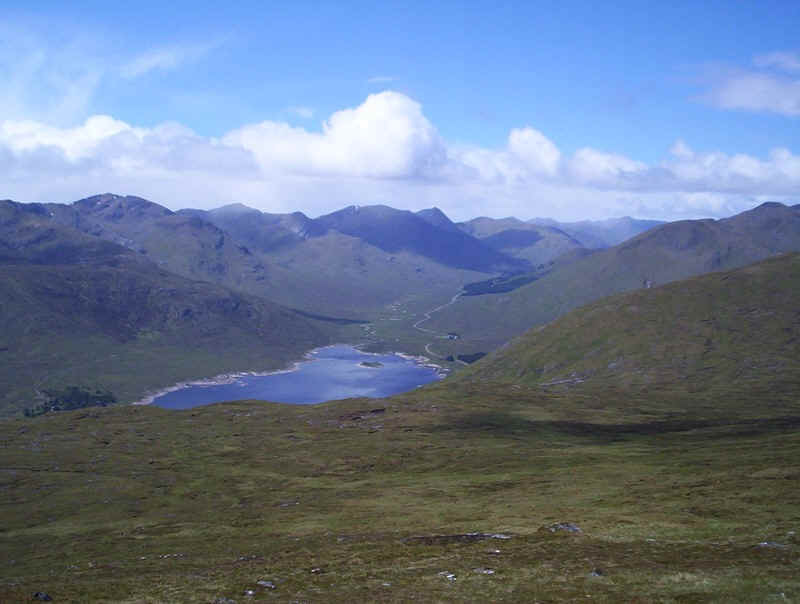 A yomp along the A87 for just over an hour found me back at the Cluanie Inn with twelve Munros and two Corbetts to add to my total.